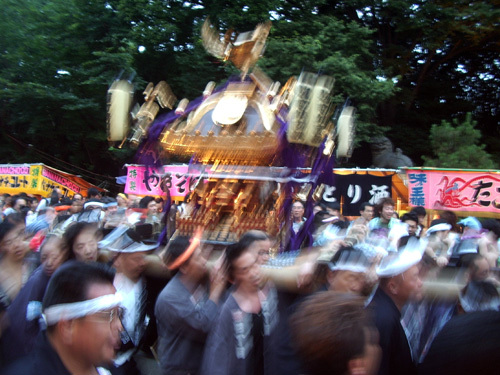 Last week I rode my bike to Fuchu to see the Plum Festival (sumomo matsuri). The festival had all the usual festival foods, but it also had a lot of stands selling really delicious plums. The plums were really just a front for the festival, and most people came to pray and buy the famous black crow fans. The fans bring you good luck for the year to come. Everyone was buying a fan and to my surprise also putting fans in a bin for burning. I then realized that all the people brought their fans from last year back to deposit before buying new ones. I also bought a fan and hung it on my wall, but I will have to remember to bring it back next year. I took lots of pictures and ate lots of good food and plums so look at the Plum Festival photo gallery as well. 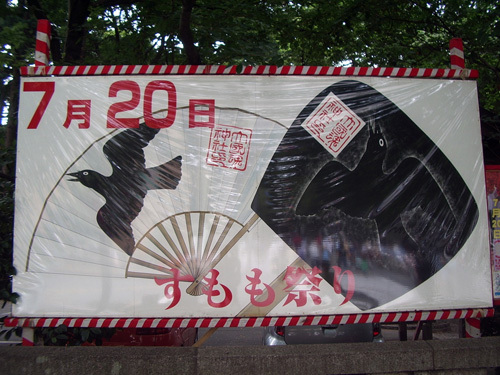 The Plum Festival and the black crow fans. 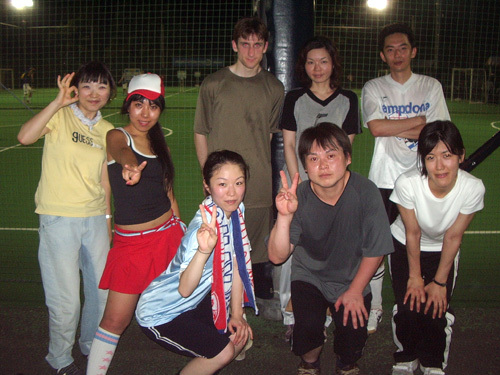 After enjoying Tsujiri and the walk through Ginza my friends and I met up with some other friends of mine to play futsal. 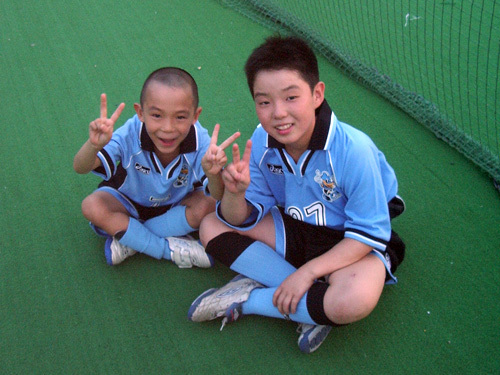 There is not much space in Japan, expecially Tokyo, to play soccer, so a lot of people play futsal. It is very similar to soccer with all the same rules, except the court is much smaller and the teams are 5 on 5. 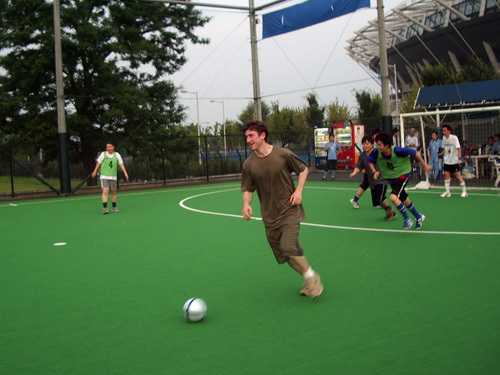 It is actually a little more fun than regular soccer as there is not as much running and there is a lot more actual touching of the ball, shooting, and just playing around. 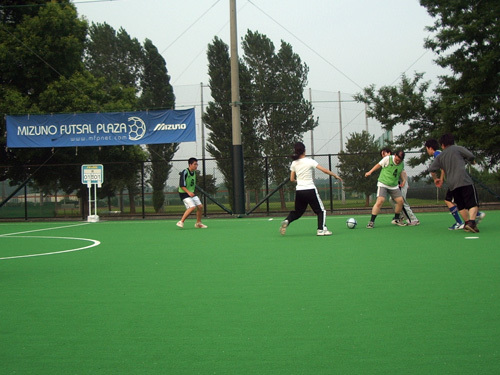 This was my first time to play futsal and my first time to play any kind of soccer since I’ve been in Japan, so I really loved it. I had so much fun and the 3 hours we had to play went by before I knew it. 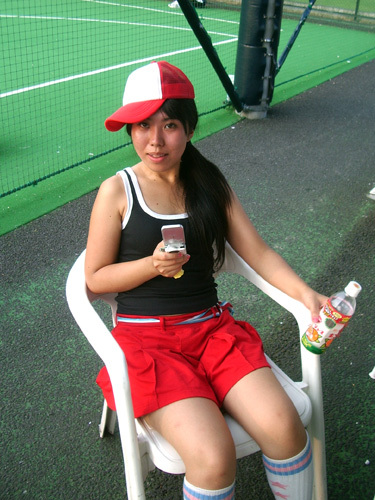 My friend Yuki all dressed in her soccer outfit. Even the kids enjoyed playing. Monday was a public holiday (Umi no hi - Ocean day) so some friends and I went to Tsujiri in Tokyo. Tsujiri is a very very famous green tea (matcha) shop in Kyoto, and there is always a line of people waiting to get in. The store is very famous for matcha parfaits. There is also 1 shop in Tokyo and it is also infamous for having a long line, so I got my friends up early to get to the shop before it opened to try to beat the line… We failed but only had to wait about 30 minutes to get in. The parfaits are incredibly good which is the reason for such long lines all the time. 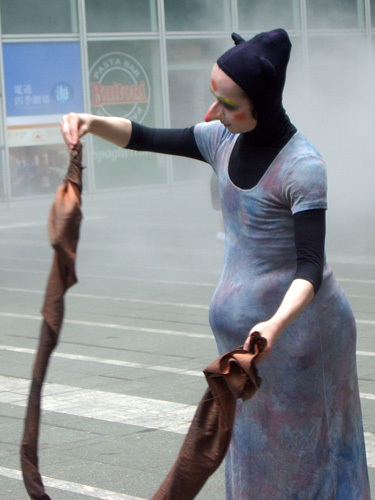 Outside there was this strange street performer. Inside looking at the menu of goodness. 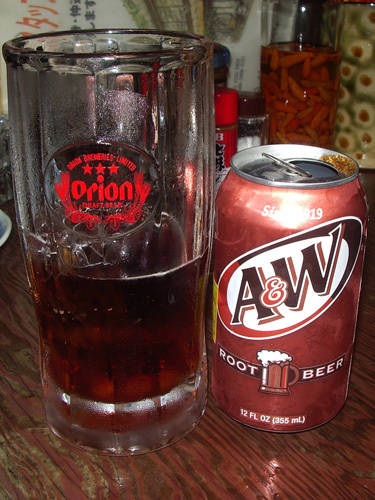 After we went to the festival at Yasukini shrine we went to an Okinawan restaraunt for dinner where I found this… it was the first time to see it in Japan so I just had to get it. 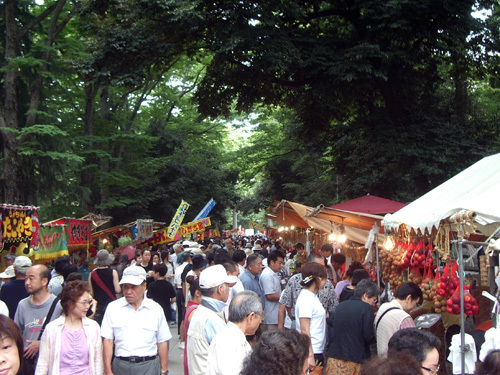 Saturday was the Mitama Matsuri at Yasukuni shrine. 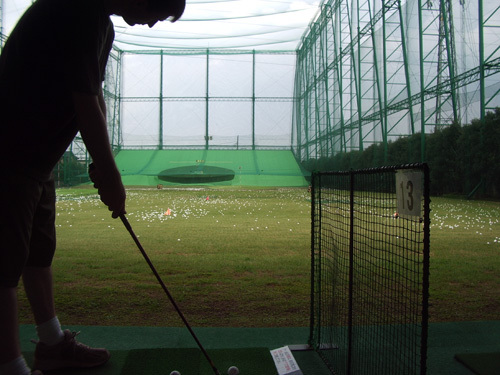 I went with my friend and her friend who was visiting Tokyo for the weekend. 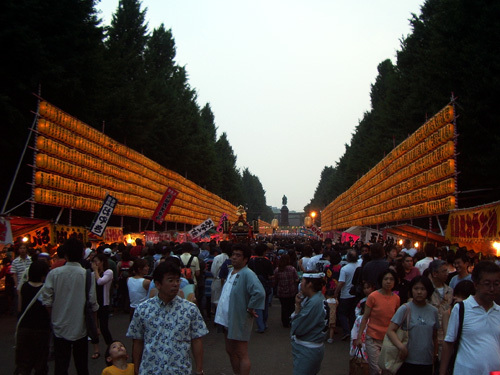 The place was packed with people so the walk to the shrine took a long time. 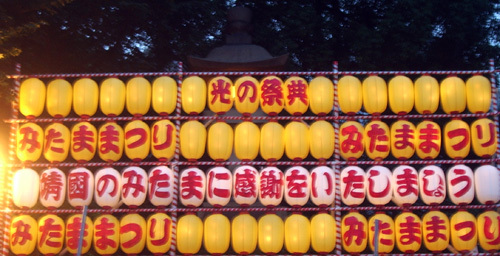 Yasukuni shrine honors all of Japan’s war dead, and the lanterns at this festival had lots of names of the dead written on them. There was also some omikoshi. Here is the Mt. Fuji phtot gallery complete with comments. From Saturday July 2 to Sunday July 3 I climbed Mt. Fuji for the second time in my life. I have been planning on climbing Mt. Fuji again for a while and this time I got many of my friends to go with me as well. 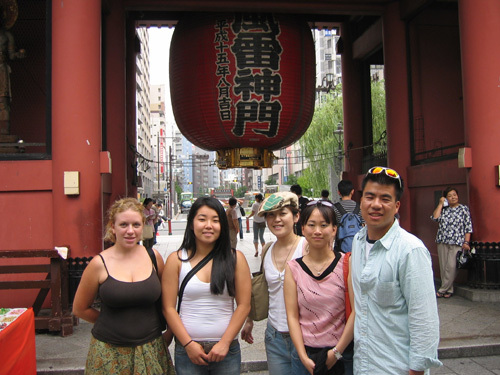 My group started out quite small, but soon grew to a group of 12 people including my sister and her friend who were visiting Japan at the time. 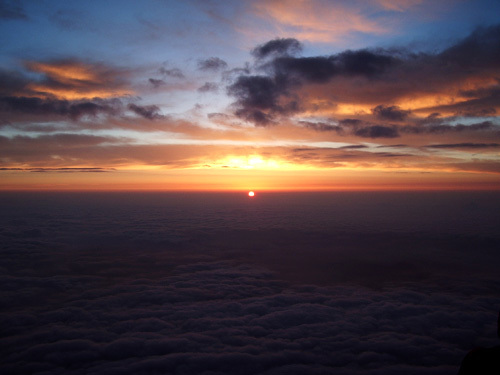 The plan was to take a bus from Shinjuku in the evening and climb all night to get to the top for the sunrise. 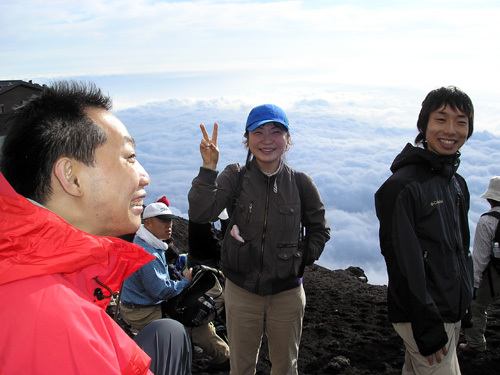 Since I was the one who was planning the trip, I had to coordinate everything as well which was difficult given that I really had no clue what I was doing in the first place, so I had a friend call the bus company to reserve 12 seats on the bus that took us directly to the 5th stage of Mt. 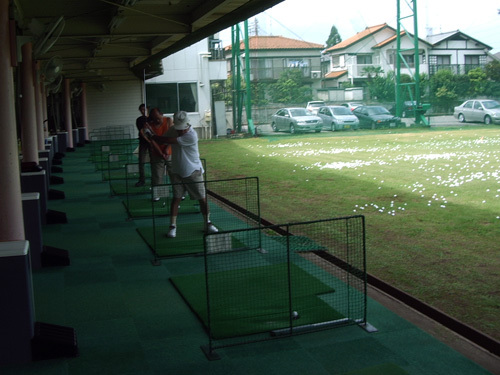 Fuji and other friends helped with other aspects of planning as well. I am not a good planner as I normally just show up to wherever and improvise. For me, climbing the mountain was a little more difficult than I expected. Last time I went, my friends and I stayed at the 8th stage to get some rest and acclimate to the altitude before climbing to the top. This time it was a nonstop race to the top before sunrise. 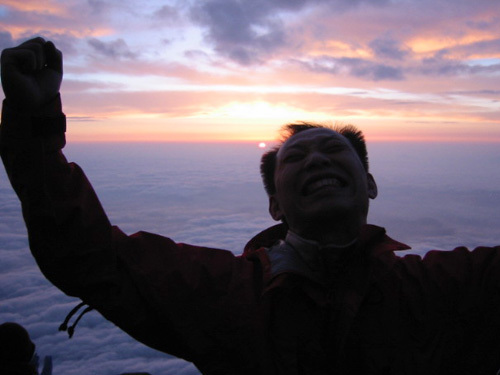 In addition, I was able to get little sleep before climbing as I had to get up at 8:30 am on Saturday morning to go to work. 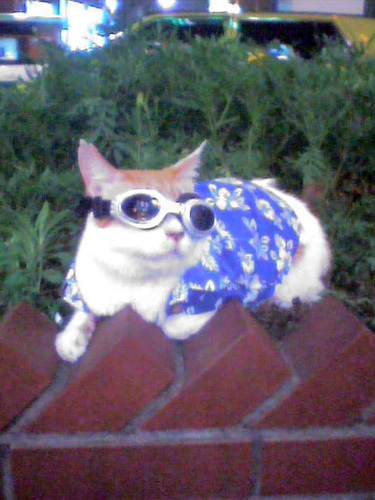 Immediately after work I went to Shinjuku and changed out of my work clothes into my hiking clothes in public. 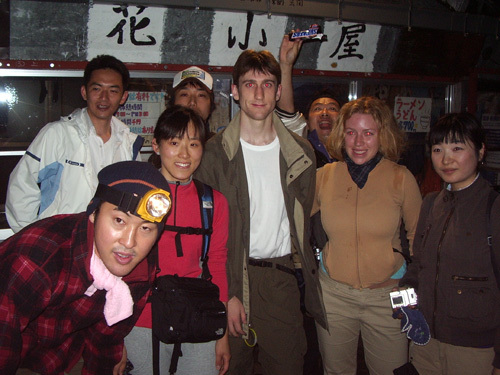 Then I met up with everyone else and we all got on the bus for ‘Fujisan gogome’. The bus arrived at around 10:00pm at the starting point of our climb. 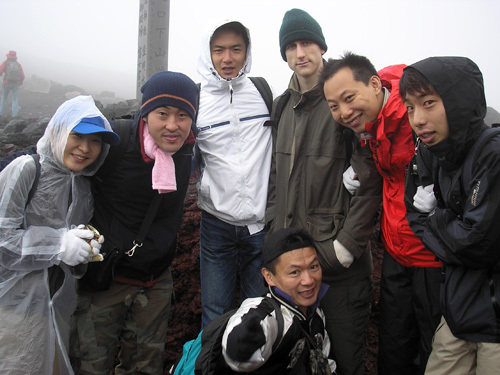 Climbing a mountain with a large group is quite difficult as everyone has their own different pace and climbing style. Overall, it was not too bad as we took lots of breaks and waited for the slower people to catch up. Around the 7th stage we were not really 1 big group anymore and instead many small groups of people climbing the mountain, but it was okay as we all knew we would meet at the top for the sunrise. Sunrise was at 4:30am and after a difficult night of climbing, of which we had nice weather, there was success… at least for some. Everyone except for 2 people eventually made it to the top of Mt. Fuji. I think only about 3 made it to the top for the sunrise, I was one of them. Unfortunately, I had to rush to the top at the end to get up in time, which considering the height of Mt. 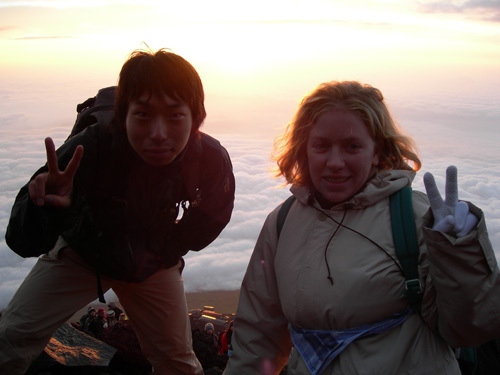 Fuji (3776 meters) was, in retrospect, not a good thing to do. 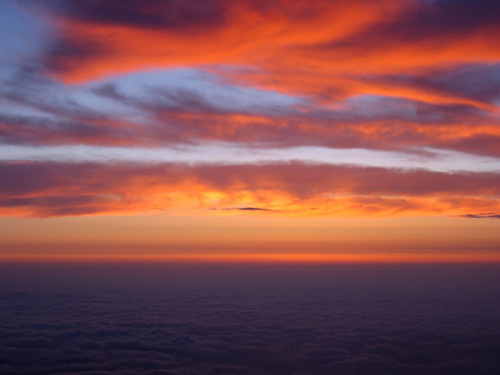 After thoroughly enjoying the beautiful sunrise my adrenaline high started to wear off and ‘kouzanbyou’ (altitude sickness) started to set in. It wasn’t that bad and I had a nice rest at the top. Once everyone had arrived at the summit we took some pictures before a few clouds started to come in and we all started to head back down. Going down was much more difficult for me as I was suffering the effects of altitude sickness, sleep deprivation, and exhaustion combined. My legs experienced some of the most severe cramp-like pain ever, and going down a mountain the path is nothing but loose rocks which did not help either. About halfway down the mountain everyone took a small break and I immediately fell asleep. They woke me up 30 minutes later to continue the decent, however I was surprisingly feeling much better and for the rest of the way and had no more problems at all. Once we all had made it back to the 5th stage we got tickets for the earliest bus out which was actually in about 2 hours from the time. So we went to a restaurant and got some lunch, ate, and proceeded to put our heads down on the table and go to sleep. After one last picture we rode the bus back home and, exhausted, all went to sleep. Some of my other friends were not able to go on this trip with me, so before I left I said I might make another climb to the top of Mt. Fuji this year. Yet on the way down I told myself that there is no way one can do this twice in a year. However, my other friends still want to go, so sometime in August I may climb Mt. 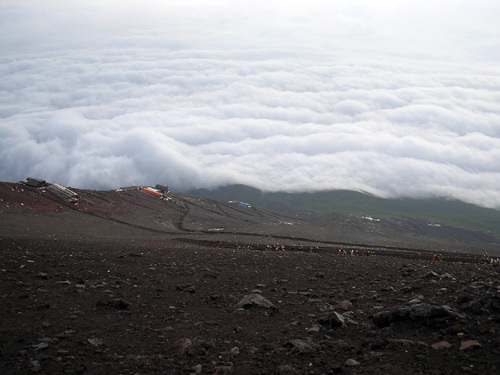 Fuji again, but next time I think we will do the smart thing and sleep at the 8th stage again. Either way, Mt. Fuji is an experience that will never be forgotten and it has become one of my most beautiful memories yet again. 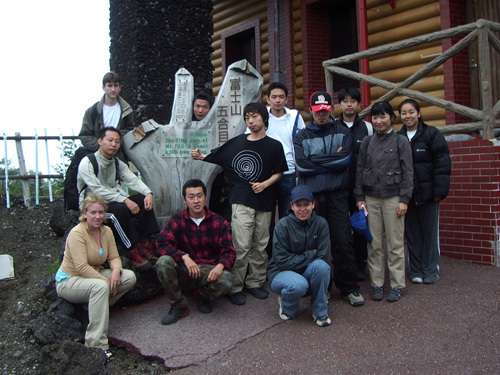 From left top row : Eiji, Masa, Wataru, Katyo, Heywon, Erika, Emily, Takeshi W.
From left bottom row : Kate, Takeshi, Me, Toru. Halfway there.. we got to keep going. One of the most satisfying and beautiful sights ever. The group at the 5th stage. We had conquered Mt. Fuji. Monjayaki is a Japanese dish that is hard to explain. You have to sit at a small table with a big hot plate in the middle. Then you take a bowl of miscellaneous ingredients and pancake like mix and put it on the hot plate. You then stir it around to cook it and then move it to the sides. After that, you take a small metal spatula and take small portions from the side and move it to the middle so that it cooks more and sticks to the spatula. You then eat it. The lady showed us how to do it the first time, but after that we were on our own. There has been no posting for a week because my sister came to Tokyo to visit last week and I have been very busy. My sister and her friend (Emily and Erika) had been in Japan for 2 weeks already, and it was time for them to visit me and Tokyo. I met them on Sunday after work in Shinjuku and we went for a walk around Shinjuku to see the nightlife. As the girls weren’t feeling too hungry we went back to my place where we made a nice vegetarian meal. My sister is a vegetarian so we couldn’t go to any restaurants with meat, which is like 100% of the ones I know. On Monday we got up, and after a breakfast of non-meat onigiri, first went to Akihabara to see the famous Tokyo electronics district. After that we went to Asakusa where we took a long walk along the food ware street before hading over to Sensoji temple and the Nakamise shopping street. For lunch we meet some friends of mine who took us out to eat ‘monjayaki’. It was also my first time to eat monjayaki and it was very interesting. Afterwards we went shopping at Nakamise street and went to Sensoji temple. 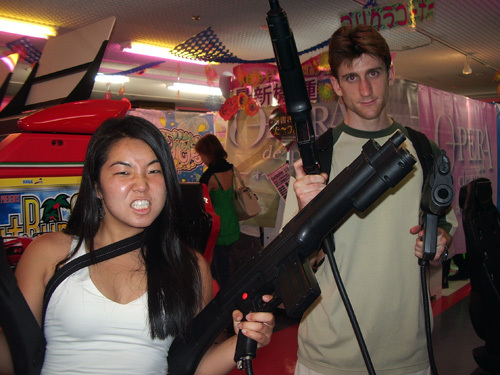 We took the waterbus down to Tokyo and since no one could think of anything they wanted to do we went to Shinjuku for some entertainment. 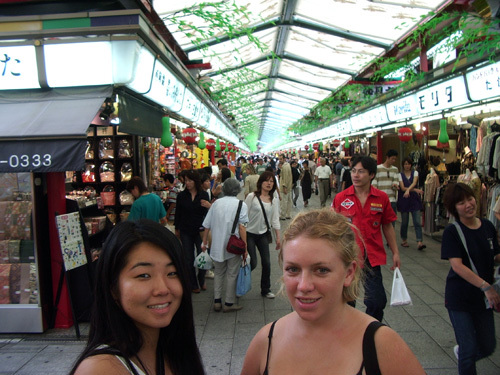 On Tuesday we got up really early to go see Tsukiji fish market. It is always great to see all the different kinds of fish and experience the busy and dangerous atmosphere of the fish market. We of course had sushi as well. After the fish market we walked a while to see the Ginza area including the Sony building. At Hibiya Park we had a nice rest and then went to the imperial palace. For lunch we met another one of my friends that works in a macrobiotic restaurant. 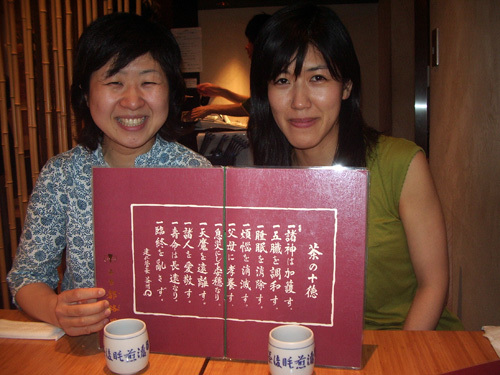 The macrobiotic place was completely vegetarian and was perfect for my sister. The food was surprisingly great as well, especially regarding the fact that there was no meat. Next to the building where my friend works is the imperial gardens, so we had an after lunch walk through it. It was also great that it was free day at the gardens as well. Being tired from getting up really early and having to walk all day we decided to go to the Japan Modern Art Museum for a relaxing time and air conditioning. 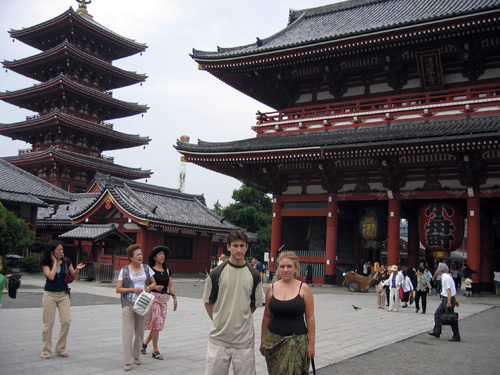 I then took them to Yasukuni Shrine followed by the Shinjuku government buildings for a nice free view of Tokyo. We went to a place in Shinjuku called ‘vegetable…’, well I forgot the name but it had vegetable in the title so we thought it would be a good place for my sister. It was pretty expensive, but it had lots of really good vegetable dishes. 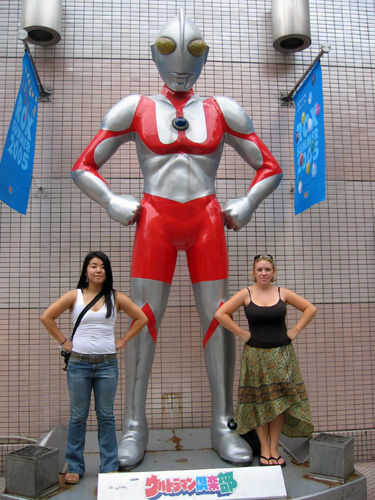 On Wednesday, I was off back to work and my sister and her friend were off to explore more of Tokyo. Although it would not be the last I would see of my sister before she left Japan. I realized I did not take many pictures of when my sister was here, but here are a few that I do have.